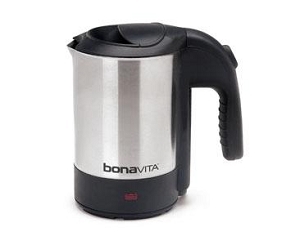 Bonavita's 0.5L Mini Kettle is a small yet powerful force. Its compact size makes it ideal to take on trips and use in small space settings. Easily use and store your Mini Kettle at the office, in a college dorm room, on an RV or boat, or wherever else you might want a hot cup of pour-over coffee or tea! We bring ours along on almost every trip. It takes up minimal room in a suitcase and allows us to brew delicious coffee in our hotel room every morning. It's become a travel essential for us!